The French firm says it is experiencing “a complex economic situation after three years of losses”. 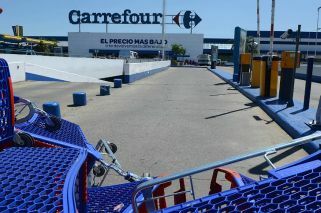 The supermarket chain Carrefour Argentina has initiated crisis prevention proceedings through the Labour Ministry, citing three years off financial losses. The move comes amid rumours that the firm will soon begin layoffs and close several stores. The company “is experiencing a complex economic situation after three years of losses”, Carrefour said in a statement, following Thursday's decision to initiate proceedings at the Labour Ministry. “A dialogue, along with the Commerce Workers Union and the government, will allow the firm to present a plan to reactive its growth”, it added. Carrefour is one of the biggest private employers in Argentina, with 18,000 workers. The French firm has 585 stores across the country. In 2015, it absorbed dozens of news stores when it took over the mini-market chain Eki. On the back of falling wage growth due to stubborn inflation, the INDEC statistics bureau reported that year-on-year supermarket sales in January fell 3.7 percent. Inflation in 2017 was 24.8 percent. The Central Bank estimates that the rate of inflation for 2018 will reach 20 percent, while the government has a 15-percent target. Private estimates put the figure at over 20 percent.